Myasthenia gravis (MG) is a problem of the immune system. It causes damage to the connection between the nerves and muscles. It can lead to muscle weakness that gets worse over time. Infants of mothers with MG can have a temporary form. It is called neonatal MG. When the baby is born, there may be muscle weakness. It often stops in about 2 months. The root cause of MG is unknown. Something triggers the immune system to attack healthy tissue. With MG, it attacks a receptor between the muscle and nerves. ACH receptors help nerve signals reach the muscle. When the receptors are damaged signals may not reach the muscle. This is what causes muscle weakness. The more damage there is, the greater the weakness will be. The thymus is may play a role in some. The thymus is an gland behind the breastbone. It makes antibodies that tell the body what to attack. It is still not clear why the thymus begins to make them. Neonatal MG is caused by the mother’s abnormal antibodies. The baby gets the antibodies from the mother. The baby will clear these abnormal antibodies in about 2 months. This will stop the muscle weakness. The goal of treatment is to decrease muscle weakness. It is mainly done by slowing the immune system. A second goal is to avoid a myasthenic crisis. This is when muscles become too weak to let you breathe properly. This is a medical emergency that will need breathing support. This proceduretakes the abnormal antibodies out of the blood. It will may need to be repeated in cycles. 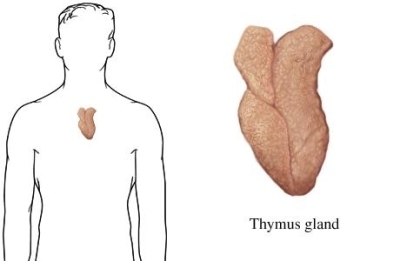 The thymus may be removed. It may improve symptoms or start permanent remission in some. Mechanical ventilation—if breathing has become difficult. Physical and Occupational Therapy—to improve some muscle weakness. To develop new ways to do daily tasks. The medical team will find a balance of medicine that does not cause further weakness. There are no steps to prevent MG.
Juel VC, Massey JM. Myasthenia gravis. Orphanet J Rare Dis. 2007 Nov 6;2:44. Myasthenia gravis. EBSCO DynaMed Plus website. Available at: http://www.dynamed.com/topics/dmp~AN~T113873/Myasthenia-gravis . Updated September 19, 2017. Accessed January 8, 2019. Myasthenia gravis fact sheet. National Institute of Neurological Disorders and Stroke website. Available at: http://www.ninds.nih.gov/disorders/myasthenia%5Fgravis/detail%5Fmyasthenia%5Fgravis.htm. Updated July 6, 2018. Accessed January 8, 2019. What is myasthenia gravis (MG)? Myasthenia Gravis Foundation of America website. Available at: http://www.myasthenia.org/WhatisMG.aspx. Accessed January 8, 2019. 11/9/2015 DynaMed Plus Systematic Literature Surveillance http://www.dynamed.com/topics/dmp~AN~T113873/Myasthenia-gravis : Kuo CF, Grainge MJ, Valdes AM, et al. Familial aggregation of systemic lupus erythematosus and coaggregation of autoimmune diseases in affected families. JAMA Intern Med. 2015;175(9):1518-1526.